In this Augustb 31, 2017 file photo, Trevone Boykin #2 of the Seattle Seahawks throws a pass against the Oakland Raiders during the second quarter of their game at the Oakland-Alameda County Coliseum on August 31, 2017 in Oakland, California. Former Texas Christian University quarterback Trevone Boykin was arrested Wednesday afternoon on charges of aggravated assault with serious bodily injury, Mansfield police said. Mansfield police had said Tuesday there was an active investigation for aggravated assault with serious bodily injury-family violence, involving Boykin and Shabrika Bailey. Officers were called to Parkland Hospital in Dallas on March 21 regarding an alleged assault in Mansfield. Officers took a statement from the victim, police said. On March 22, detectives executed a search warrant at the home where the assault allegedly occurred and interviewed Boykin. During the investigation, detectives noticed there were cameras in the house that may have captured the alleged assault and removed a DVR connected to the cameras. Police say detectives obtained a search warrant for the contents of the DVR and reviewed the video footage of what appeared to be an assault inside the residence. On Wednesday, Boykin was arrested at his residence without incident and was to be booked into the Mansfield jail. Boykin bonded out of jail Thursday evening. On Tuesday, the Seattle Seahawks released Boykin. 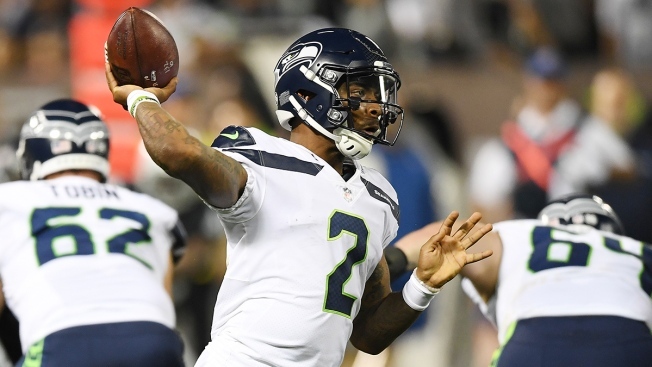 In a statement released to NFL Network reporter Ian Rapoport - Boykin said he understood the Seahawks decision to release him but that "the story is false" and that he "was not involved in a physical altercation." Boykin went on to say the woman was lying about him. "This person has fabricated a story and I am suffering the consequences." Boykin said he believed he would be "vindicated." Boykin and Bailey's names have been in the news before. In March 2017, they were arrested after she crashed a car into Sidebar Uptown Dallas, eight people were injured. She was arrested on two counts of intoxication assault with a vehicle. Boykin was arrested for public intoxication and marijuana possession. In June 2016 the former TCU quarterback pleaded no contest to resisting arrest over an incident that led to his suspension for his final college game at the Alamo Bowl. Boykin originally faced a felony charge of assaulting a police officer during an incident at a bar two days before the Horned Frogs beat Oregon in the Alamo Bowl on Jan. 2, 2016. Boykin agreed to a one-year probation in the case and had the felony charge dismissed. NBC 5 is reaching out to Boykin's mother and agent about the most recent allegations and his release from the Seahawks, we are awaiting a response.